Summer is the time when many home and commercial construction projects are planned. After all, winter weather in many areas can severely limit opportunities for construction activity. Despite the fact that summer provides a good opportunity and better weather for many projects, it may also bring some climate-related challenges. High heat coupled with low humidity, for example, may result in poor concrete. Let’s look at why that is. Concrete cures through a process known as hydration. As the hydration process occurs, it also generates heat, as ConcreteNetwork.com notes. The warmer the concrete is while it is curing, the faster the curing process. Since it is difficult to keep concrete cool during hot weather, this can result in an accelerated curing time. If concrete cures faster than anticipated, it can reduce the amount of time that the concrete has to properly harden, resulting in weakened concrete. The faster curing time also shortens the time when the concrete is workable. This may require adding additional water to keep the concrete workable, but adding water may also weaken the concrete. A related problem involves surface drying. As concrete cures, water moves out of the concrete toward the surface. During hot and dry weather, the moisture on the surface of the concrete evaporates quickly. This rapid evaporation allows more moisture to escape from the concrete. With concrete wicking away moisture on an accelerated time table, you may find that your poured surface suffer from shrinkage and cracking. There are steps that you can take to reduce the risk of rapid surface drying during hot and dry weather. Mixing concrete using cool water can help to keep the concrete temperature lower for a period of time. This helps at the initial pour, but you’ll want to try and keep the concrete cool throughout curing as much as possible. Another method involves wetting the substrate and forms before pouring concrete. Finally, fresh-poured surfaces can be moistened to keep them cool. You can also build structures to shelter concrete from wind or provide extra shade to keep conditions around the concrete cooler to slow evaporation during warm weather. Templin Concrete Construction is dedicated to providing high-quality concrete construction at the best price, and we know how to pour and maintain concrete in all weather conditions. We have been proudly serving the east central Minnesota area for years, and we can help with your next project. 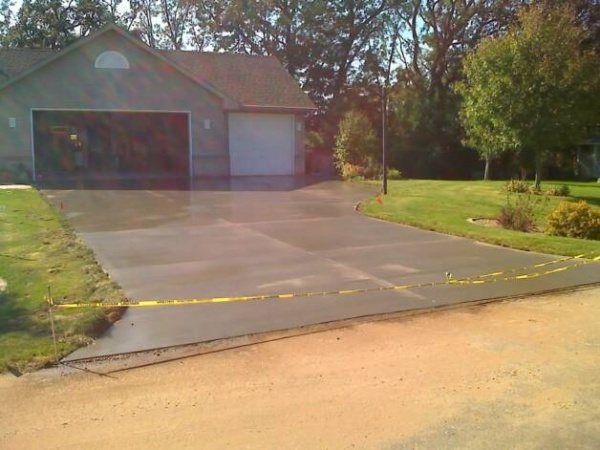 Whether you need a garage floor, a new driveway or some decorative or patio concrete poured, let us make sure it’s done right. Call us today at 612-388-1945 to learn more about our full range of concrete construction services.